One of the main problems I had with Ubuntu 7.04 (Feisty Fawn) as you will recall, was the extremely poor power management. You don’t spend thousands of euros on a laptop to install an operating system on that drains its batteries in half the time it takes Windows to do the same. 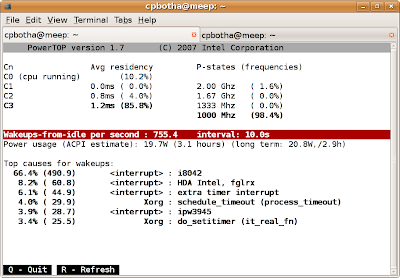 Shortly around that time, somebody pointed me at Linux Powertop, a tool developed by Intel’s Arjan van der Ven and that’s able to find the various processes that drain one’s battery. Another important component of the new power saving regime is the tickless Linux kernel: instead of waking up a set number of times per second like some obsessive-compulsive retard, it wakes up only when necessary and thus has the potential to save you even more power. Neither of these worked out of the box on Feisty. Yes, I know that one can install a backported kernel, I chose not to. Had important stuff to do. Recently I managed to come into the possession of a 500G USB external hard disc. The temptation was far too great, and I installed Ubuntu Gutsy Gibbon Tribe 5 (an alpha of the forthcoming 7.10) on a partition on this disc. Along with my laptop’s “boot from USB” functionality and GRUB on the MBR of the USB disc, I now have a beautiful bleeding-edge Linux to play with. Of course this only happens when I Don’t Have Important Stuff to Do. In a few minutes, my laptop’s power consumption was reduced from 31.9W (1.7 hours) to 19.7W (3.1 hours), a significant savings. You may again colour me impressed. So, it seems Gutsy Gibbon will probably address Feisty’s power-consumption issues. If it also delivers on its promise of better dynamic display (i.e. changing display at runtime) support, I will have to find something else to complain about.